It’s almost impossible to believe but we’ve been in France for nearly three weeks and we haven’t yet been to a street market. Street markets are pretty much a religion in France except, it seems, in the Marais Poitevin where we spent two of our first three weeks. For some reason the villages of the marais appear to be a bit of an exception and street markets are as rare as hens’ teeth. In areas of France that do adhere to the market religion, attending them is either a matter of luck or must be carefully planned. Some larger places have two markets a week but most have just one. You plan them, or you happen upon them. 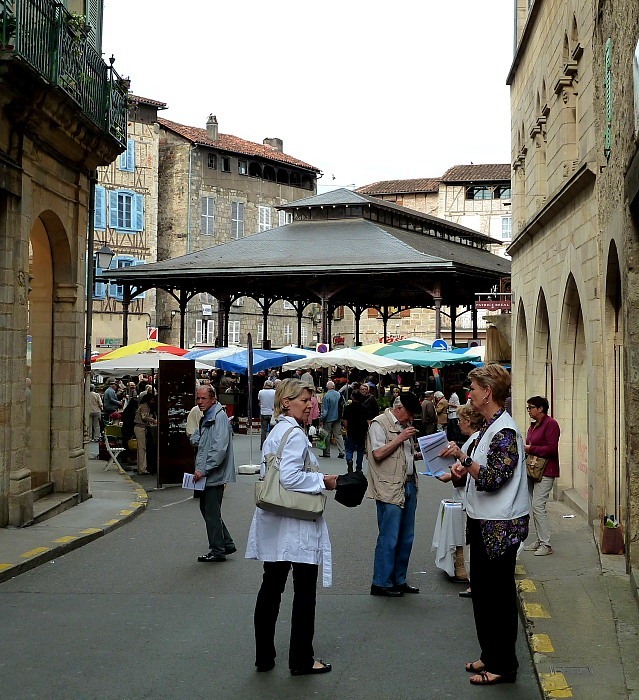 By arriving at Figeac on Friday, we happened upon its market which is held on Saturday. Hoorah! We are camped within walking distance of town so, market bags in hand, at about 10:00 AM on Saturday, off we set à pied. Figeac is not particularly colourful but it has a splendid old metal market hall around and under which cluster many of the modern stall holders. The market is quite large, spreading along several streets radiating off the old market square with its splendid metal halle [market hall] seen in the background of this picture (left). gives an impression of the elegance of the old structure. (The lady in the right foreground is trying to drum up support for blood donations, BTW.) 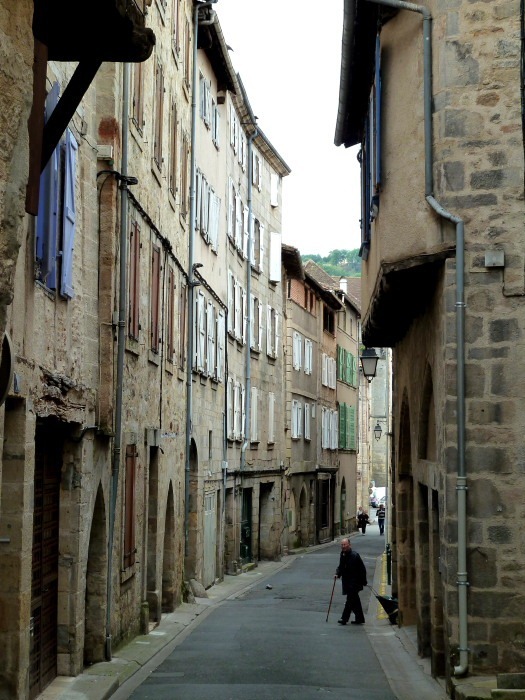 On our wandering way to the market, Francine grabbed this other picture of a local gentleman setting out to market dragging his wheeled shopping bag behind him along one of the typically narrow streets. Slightly curiously and unique in markets of my experience, I failed to spot a fresh fish stall, though that’s possible simply because I missed it in the sprawl of stalls. 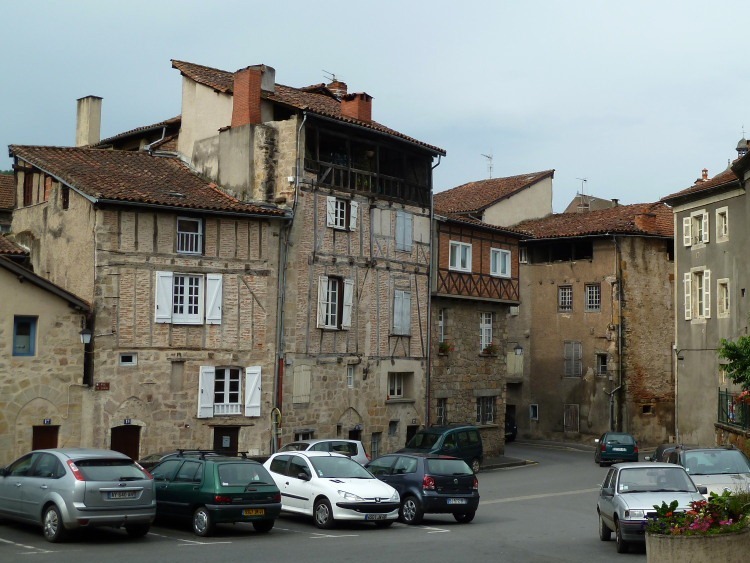 Markets aside, Figeac is noted for two things, in the main. One is for some of its buildings’ old solelhos. The town was a centre of tanning in the Middle Ages and the solelhos were open wooden sided galleries on the topmost floor of tanners’ buildings used for drying skins. Now they are converted as accommodation and one can be seen in the centre building of this picture. The other thing that Figeac is noted for is being the birthplace of Jean-Francois Champollion who famously cracked Egyptian hieroglyphics by deciphering the triple text of the Rosetta Stone (it says here). This is a little difficult to capture photographically although there is a museum with hieroglyphs placed strategically. The market got in the way, though. 😀 It must have been arduous work because the poor man died aged only 41. Hopefully we will live long enough to stay here for a day or two before moving on to our next stop.